KVMGalore is pleased to announce the release of the new Kramer VP−732 ProScale presentation switcher/scaler, designed for classrooms and boardrooms. 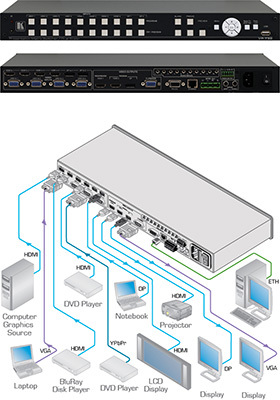 With support for digital and analog video, analog stereo and embedded audio signals, the 10-input presentation switcher/scaler up- or down-scales to independent program and preview outputs. The unit features two HDMI, one DisplayPort and one HD-15 (VGA) outputs. In Preview mode, VP−732 scales two inputs independently to two different outputs – Program up to 4K-UHD @ 30 and Preview up to 720p. VP−732 also offers a Picture-in-Picture (PiP) mode where two inputs can be displayed simultaneously on the same output. Kramer's VP−732 features glitch-free switching with ultra-fast FTB™ (fade-thru-black) technology and convenient Web page control. The unit includes a 2x10 power amplifier for driving external speakers. New VP−732 is now available on KVMGalore. For other Kramer products - visit Kramer store on KVMGalore.